Discipline and fairness are key aspects of a school’s culture. A growing body of research shows that supportive, positive systems of discipline can radically improve social, emotional, and academic outcomes for students. Yet, recent federal civil rights data suggest that discipline policies and protocols in U.S. schools are administered and experienced inconsistently across schools and populations. 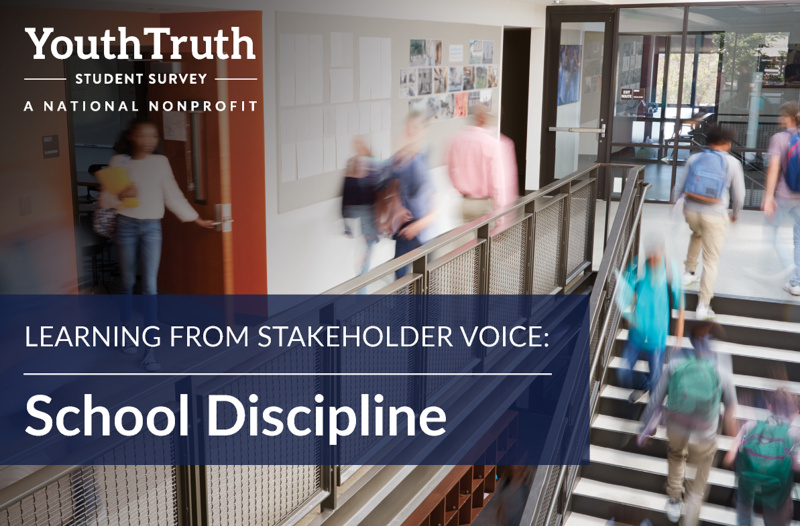 YouthTruth elevates student and stakeholder voices on critical issues in education, and posed the quetion: what do students, families, and staff think about discipline and fairness at their school? To answer this question, they analyzed survey data collected between fall 2016 and the end of 2018. 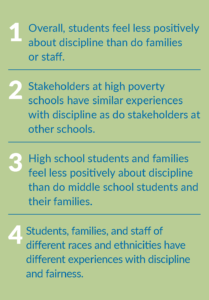 They examined perceptions of discipline across 104,000+ secondary students, families, and staff members and uncovered a number of insights. School-to-Prison Pipeline examines what the school-to-prison pipeline is and who is affected. It also examines punishing policies, best practices, and how students can avoid the pipeline. Also included is, “Rerouting the Pipleine” a resource that examines shifts in teachers’ responses to discipline. Read more. . .